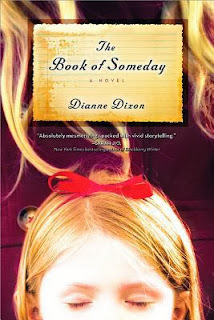 I can't say I enjoyed The Book of Someday very much at all, and I actually am only rating it so high because the author is quite talented in describing things very well but her plot left a lot to be desired. A lot of inconsistencies, things just plainly left right out and a story that dragged on and on were just some of my issues with this book. The story wasn't very logical or thrilling. I sort of feel like the author left out certain details to try and create the suspense that this book was so sorely lacking. But instead of it being suspenseful, it was just irritating. I found the characters to be weak and inconsistent. For example, one moment Livvi is the victim of abuse, a broken and hurt individual and the next she is completely different. I just didn't buy the fact that characters could be so different from chapter to chapter. After all, how many people do you know that change that radically from one day to the next? The story had promise but it dragged on and on. And I don't know why it seems to be a trend lately, but why write a book with a character in the book who also wrote a book by the very same name? It isn't the first time I have encountered it and I find it equally as annoying every time. In the end, The Book of Someday was one of the ones where I kept hoping it would get better and at some points it seemed like it might but in the end, it just felt short of the mark.